Who would have dreamt today’s great rally in Dow Jones Industrial Averages after yesterday’s over 200-point drop from the pre-FOMC levels to close. But that is what happened. At one point Dow was more than hundred-and-forty points in the red from previous close and then it staged a 277-point rally before closing out at +225 points. The Asian markets didn’t like the U.S. indices post-FOMC tantrums and most of them closed in the red for the day: Japan -1.1%, China -1.3%, South Korea -0.5%, Hog Kong -1.1%, Indonesia -0.1% and Thailand -0.4%. Only Australia and India were positive in the East. Australia was up +0.3% and India +0.4%. 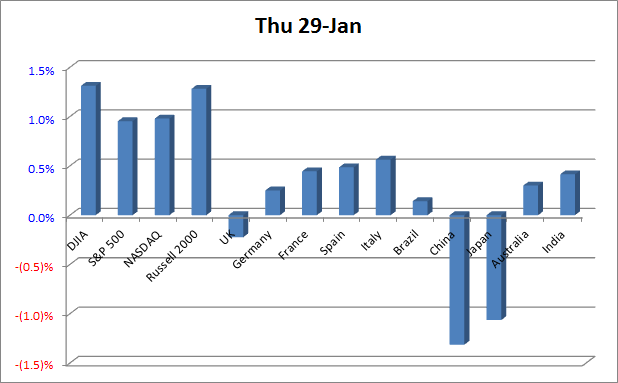 The European bourses opened in the red too but then turned around and closed up. The U.S. indices turned around at about 10:30 AM EST. There were many events with significance today. 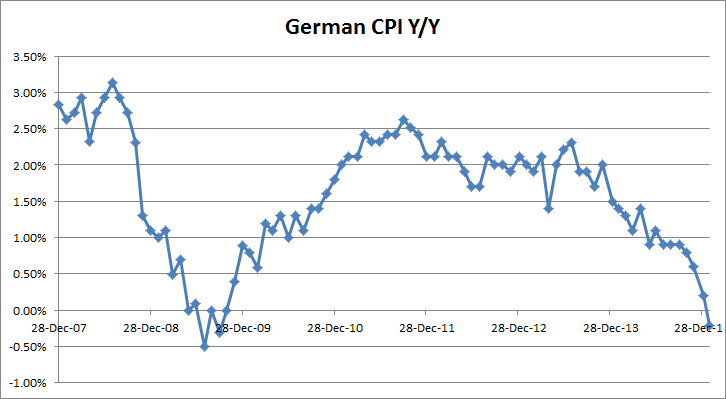 The German Prelim CPI m/m at -1.0% was below the forecast of -0.8%. This is in deflation territory. The Spanish Retail Sales y/y came at 6.5%, above the expectations of 2.5% – this a good reading in the current environment. German Unemployment Change was -9K, worse than the forecast of -10K. The UK’s CBI Realized Sales was at 39, better than the forecast of 31. It is a leading indicator of consumer spending based upon 125 retail and wholesale companies. Higher reading shows better inflation expectations. UK’s Nationwide HPI was also better at 6.8% compared to forecast of 6.6%. Danish National Bank on Thursday cut its deposit rate by 15 basis points to negative 0.5% in an effort to prevent krone from strengthening too much against the euro. This is the third time that the bank has cut rates in less than two weeks. 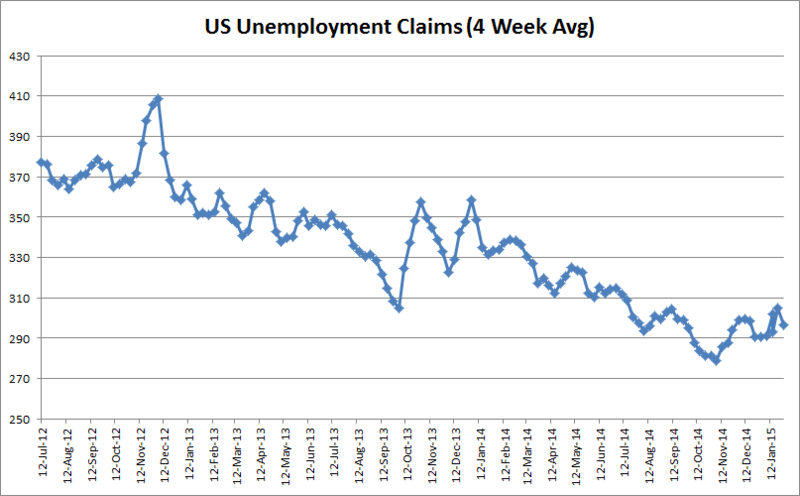 U.S. Unemployment Claims were much better than expected, in fact they are at a 15-year low. This strengthened the hawks view of Fed sticking to its mid-year rate-hike schedule. Only 265K people claimed unemployment benefits for the first time during the past week. The expectations were for 301K. This is the second lowest number since 1973. The 4-week average stands at 298K. After peaking in 2012, it has been showing a nice down-trend. 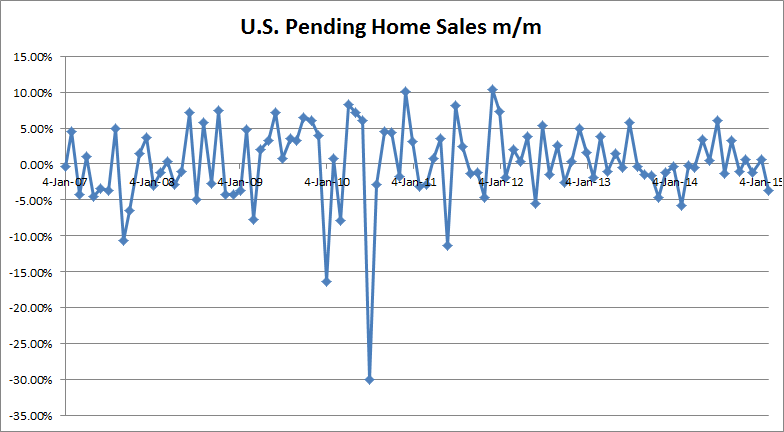 Later at 10:00 AM, the Pending Home Sales m/m number greatly disappointed. The actual reading was -3.7% when the forecast called for +0.6%. U.S. homeownership fell to a 20-year low in the fourth quarter. The seasonally adjusted rate of homeownership is at 63.9, a decline from a high of 69.4 reached in 2004. Overall it does increase concerns about the health of housing sector, without this sector there isn’t much to the recovery. So maybe Fed will not stick to its schedule ??? Whatever, the market started to rise around 10:30 AM. Crude Oil also started to move up around 11:00 AM. West Texas Light Crude Oil Futures made a low of 43.58 and then it closed up 44.59 at 2:30 PM. Gold had it worst day in over 13-months and dropped over $30 per contract. Market says that lower jobless claims bolster rate-hike scenario. But then it could be due to the deflationary fears too – such is the way gold is trading these days. Most of the trusted relationship that the precious metal had with other asset classes have become suspect over the last several months. Today, the dollar index declined, which used to be bullish for gold. Overnight, Alibaba had announced unimpressive earnings and its stock got hammered. On Thursday, it closed at $89.81 after making a high of 120 on November 13, 2014. this puts the high-flying Chinese company in bear-market territory. The 30-minute chart of S&P 500 is making a nice horizontal channel since the start of the month. Today’s action made the index bounce off the lower bound near 1990. The upper limit is near 2063. 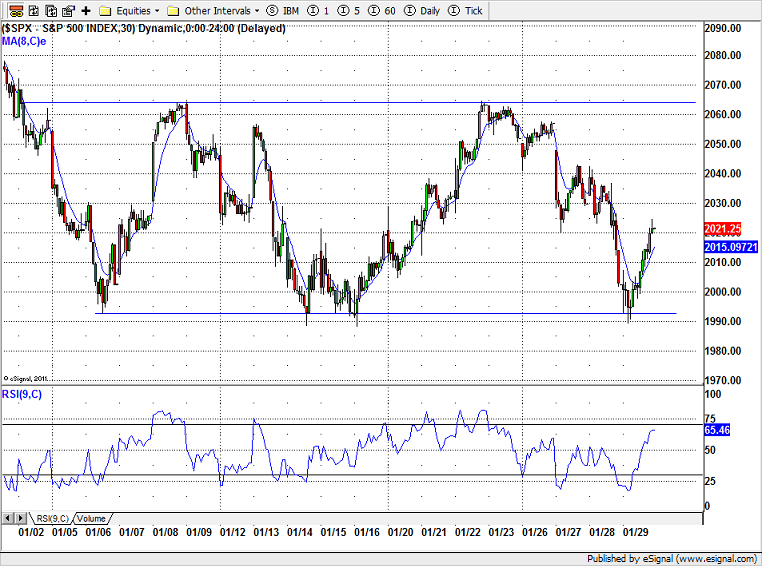 So far S&P 500 has not given any indication which way it will break. But sooner or later it has to break out of the trading range. 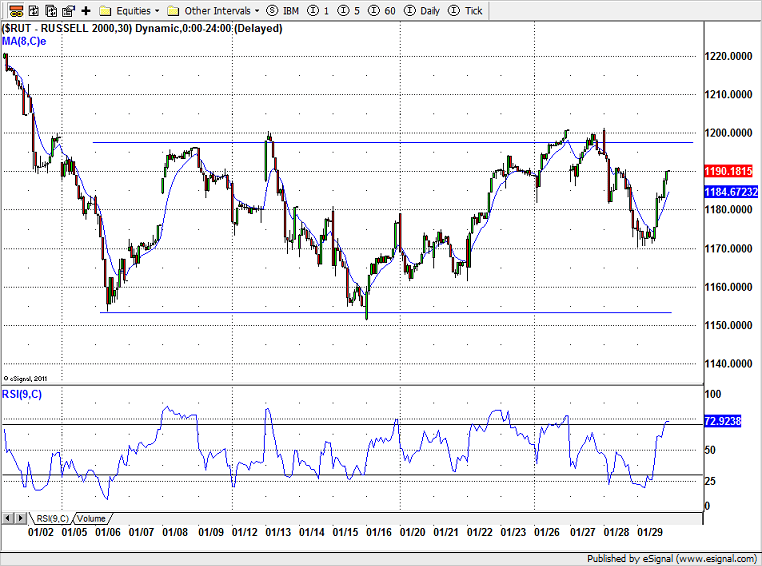 A break above the upper-bound will take the index to challenge the all-time high of 2093 and maybe surpass it. A break below the lower-bound may take it to the support of 1820. The current price-action has increased the probability of index reaching the upper-limit more than it falling back to the lower limit. Dow Jones Industrial Averages, on the other hand, did break below a similar horizontal channel yesterday but today it turned around at about 10:30 AM and then crossed above the lower-bound. The snapback increases the chance of index travelling toward the upper-bound above 17800. On the 30-minute chart, Dow has been making lower-lows and lower-highs for a week. It has yet to break the down-trend line (not drawn in the chart). Until it break that trend-line, its upward move is going to be suspect. 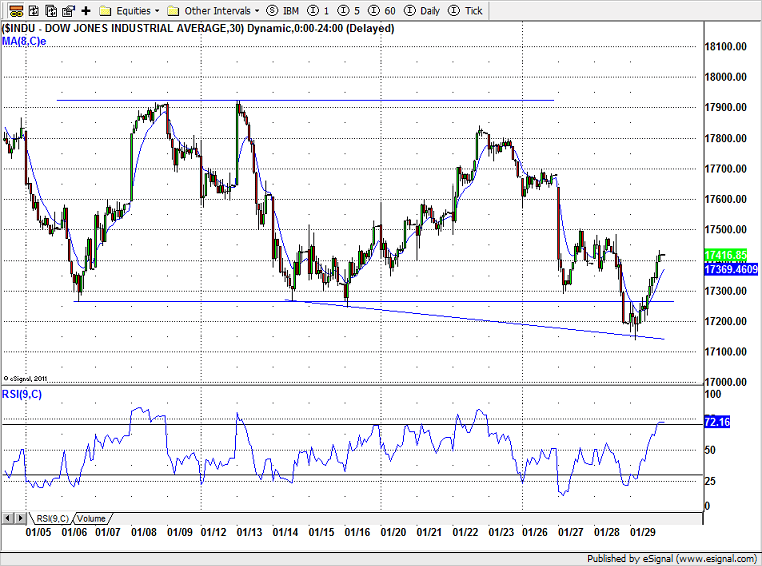 The down trend line will break when the index moves above 17500. The small cap, Russell 2000 has been performing better than other U.S. indices. It is also trading in a horizontal channel, but unlike S&P 500 and Dow it hasn’t dropped back into the lower half of the channel after touching the upper-bound on January 27th. The chart pattern of NASDAQ Composite is similar to that of Russell 2000, which is not surprising as it has many small-cap stocks. Seasonally January-end / February-begin is good for Dow stocks. Dow is trying to prove it right. January 30, 2015 in Market Commentary.